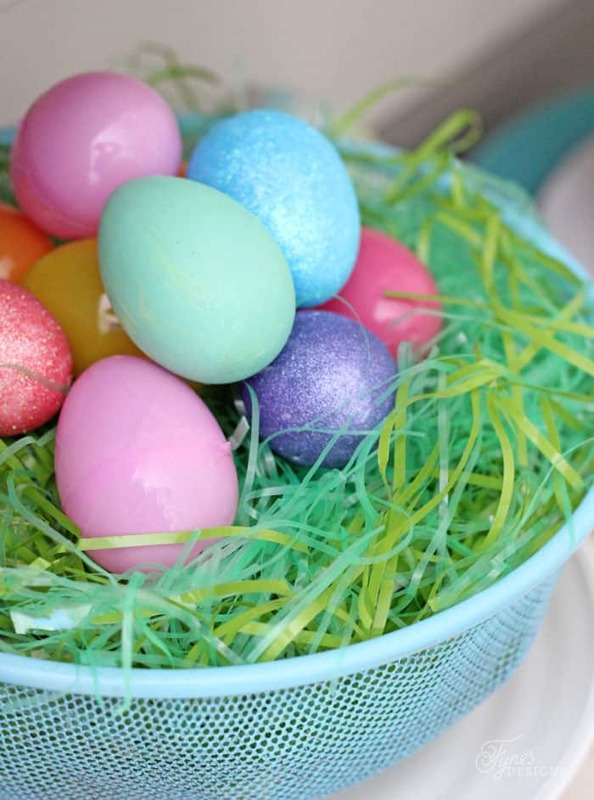 I love everything about Spring, the chirping chicks, the sweet breath of new life, and all the bright colors Easter brings. My Easter decor is always mixed. 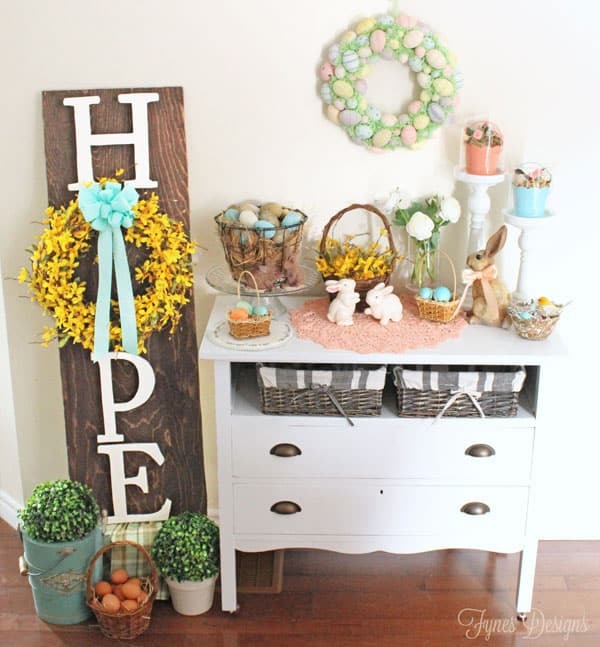 I love bright shiny happy colors like I used in this Happy Hoppy Easter Sign, but I love the vintage look of the muted pastels and brown bunnies of years gone by like I used last year on Hope Easter Sign. 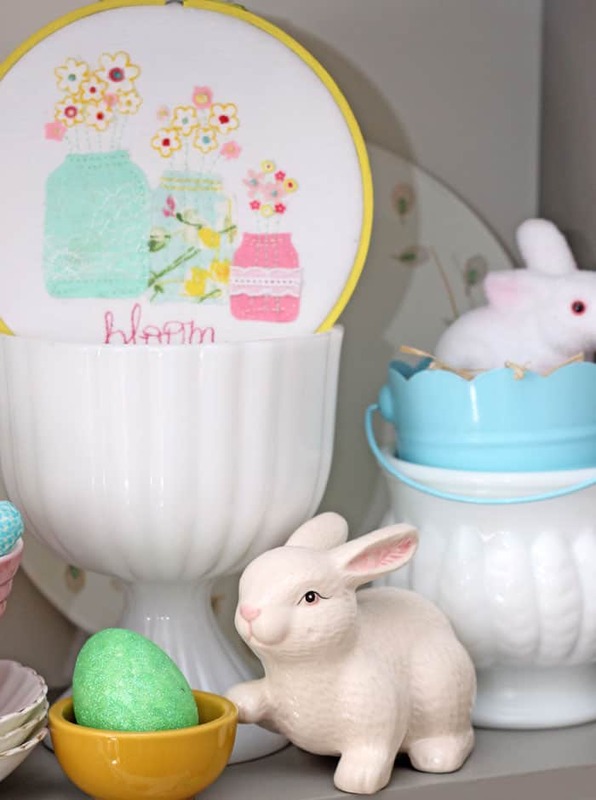 This year I decide to set up two different vignettes, a rustic vignette you can see here, and this Bright Easter Hutch, it makes me smile every time I look at it, the kids are crazy for it too! 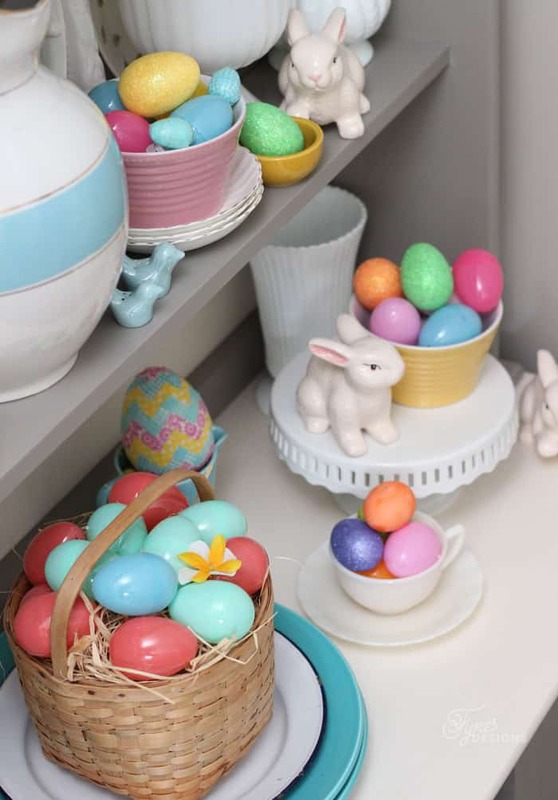 I really like to cram my hutch full of fun little decorations, maybe too many, but I just can’t stop once I start, ha! 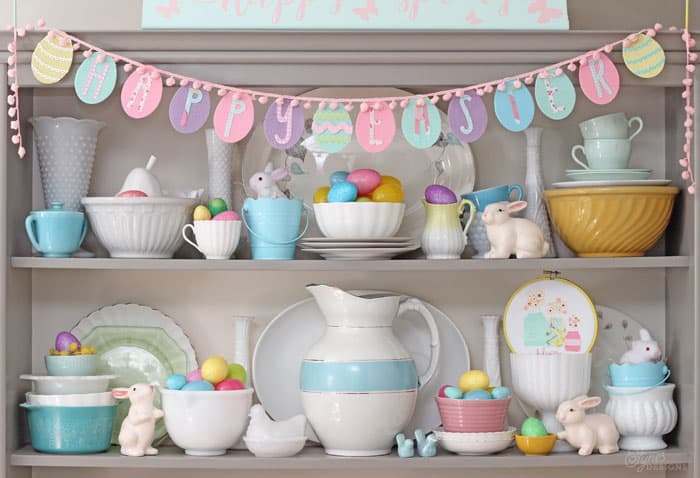 It all started with this Happy Easter Garland I made last week, can you believe I made it with a dollar store craft pack? Yup, cost me less than $5 to make, be sure to check out that easy tutorial. I didn’t spend a lot to decorate my hutch, I just used what I had around the house. 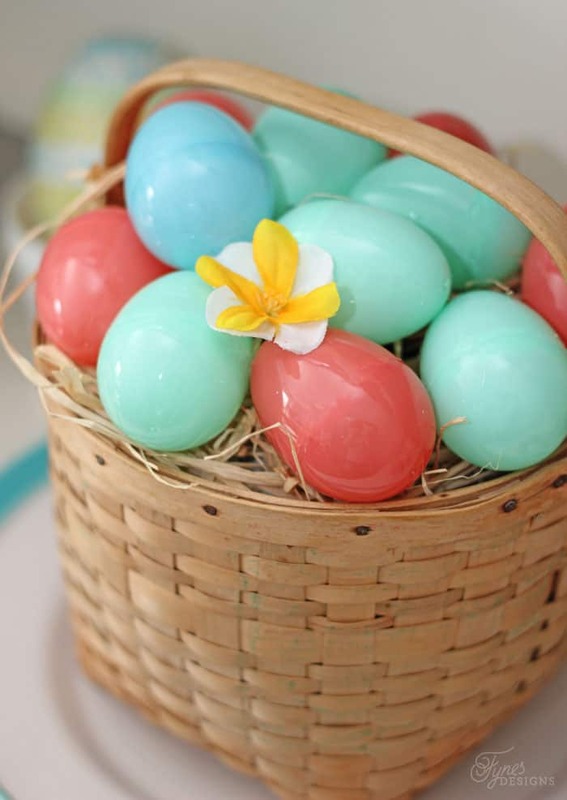 Plastic eggs are the star of the show, they add so much fun color! 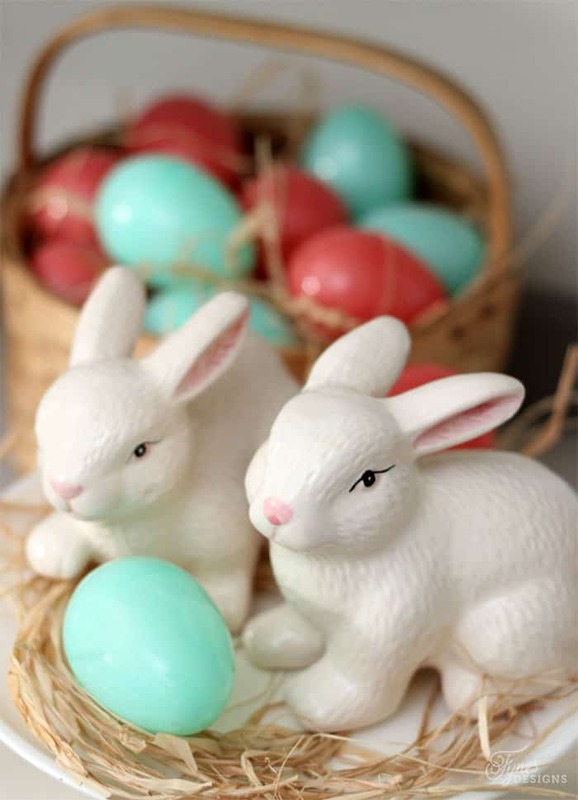 These little glass bunnies from the dollar store are too cute, can you believe they are only $1.50?! I may buy shares in them. Plus I picked up these wire frame bunnies at our local dollar store for only 99¢! I’m sure you recall me mention Bargain Harley’s before! I also incorporated a piece of my hoop art into the hutch, blooming flowers are the perfect reminder spring is on its way! 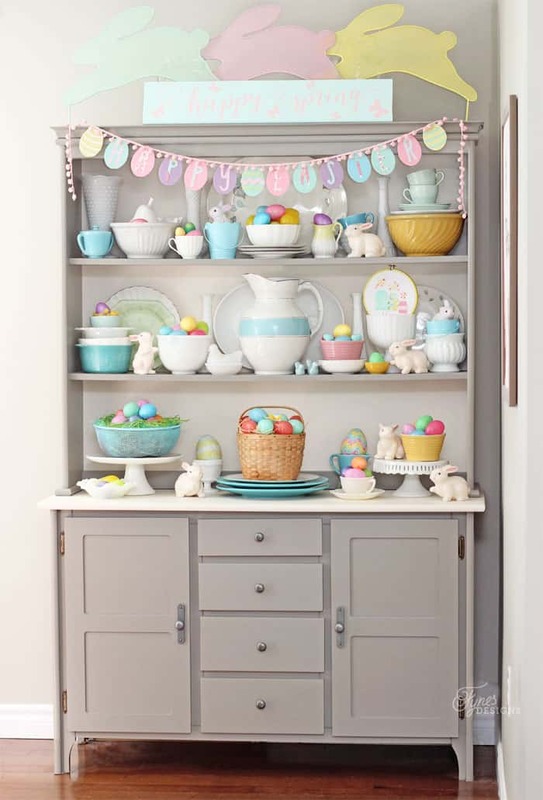 My Easter Hutch really brightens up our home, hope your getting your easter on too! Beautiful, as always. Where do you store all your stuff in the off season? That’s my biggest challenge. 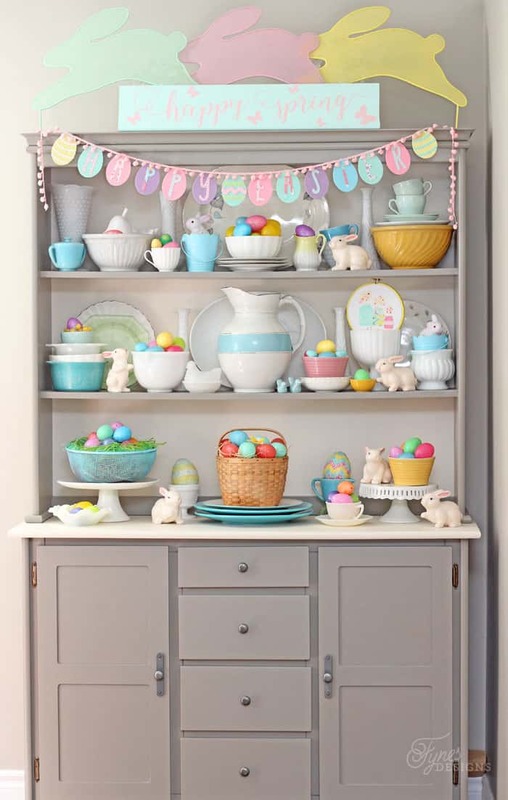 Love your Easter hutch! So colorful and fun! Thanks Heather, i love making them! Very cute! I love all the fun color! I spotted your cute decorations at the Creative Collection link party and had to stop by! Thanks Bernadette, I love some bright splashes of color when spring is on our doorstep!